Tezos (XTZs) need to be delegated to a baker to earn block rewards. Staked offers an anonymous and fully automated delegation service for Tezos baking. We post the required bond for baking and charge a 10% baking fee. Effective yield estimates based on a 62.5 second block interval. The Tezos blockchain protocol is a delegated proof-of-stake system that supports Turing complete smart contracts. Tezos is implemented in OCaml, a functional programming language that offers speed, an unambiguous syntax and semantics, and formal proofs of correctness. 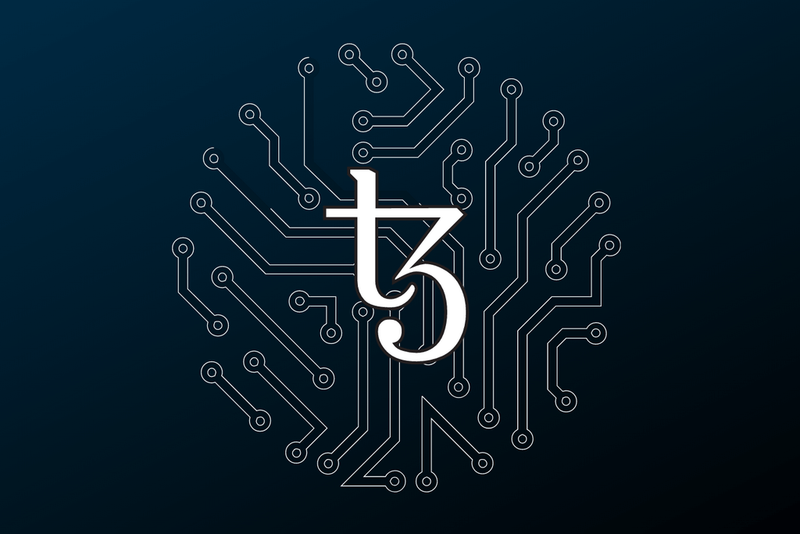 The Tezos betanet was launched on June 30th, 2018, and started processing real transactions that will persist on ‘mainnet’. The Tezos Foundation was responsible for all block production and validation during the first seven cycles, approximately three weeks. On July 21st, 2018, the first non-Tezos Foundation, or ‘community’ block was baked. Baking is what Tezos refers to as the action of signing and publishing a new block in the chain. Bakers need at least 10,000 XTZ (~ $22,000) to qualify as a delegate, and having additional delegated stake increases their chances of being selected as a Baker or Endorser. At the beginning of each cycle (4096 blocks or ~ 3 days), the Bakers for each block are randomly selected and published. Bakers earn a block reward of 16 XTZ for baking a block. In addition to the Baker, 32 Endorsers are randomly selected to verify the last block that was baked. Endorsers receive 2 XTZ for each block they endorse. Block rewards are funded by protocol defined inflation. Rewards are calibrated so that the number of XTZ tokens grows at roughly 5.5% per year. 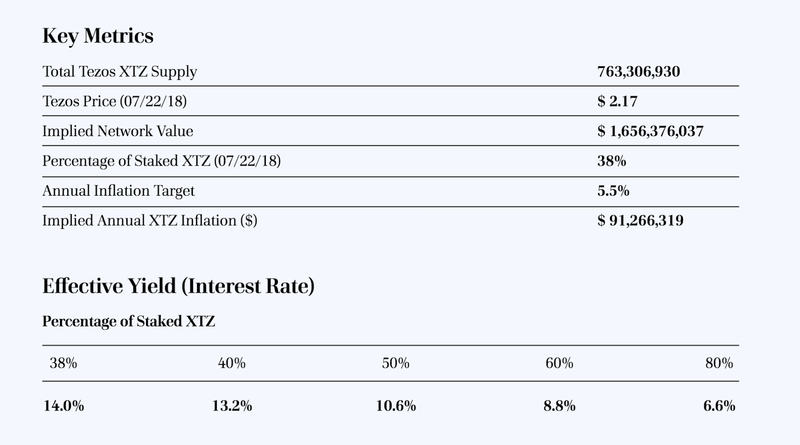 If 100% of Tezos tokens are delegated, the annualized yield will be 5.5%. Currently, 38% of Tezos tokens have been delegated, including the 10% owned by the Tezos Foundation, so the annualized yield is currently 14%. To ensure Bakers and Endorsers act honestly, they are required to post a security deposit for each block they Bake or Endorse. They forfeit this deposit in the event of malicious activity, such as double baking or double endorsing a block. Protocol amendments are adopted over election cycles 131,072 blocks, or ~3 months. This cycle is expected to increase in length as the protocol matures. A quorum of 80% is required for governance proposals. To choose a Delegate and participate in Tezos’s proof-of-stake mechanism, you will need to first activate your XTZ Allocation, create an account for delegating that stake, and specify the public delegate key responsible for taking part in baking and governance on your behalf. You can change the delegate at any time, though the change only becomes effective after N cycles. Staked operates the most secure, performant, and cost-effective block production nodes for decentralized PoS protocols on behalf of institutional investors. Our multi-tier listening and signing node architecture delivers stakeholders the ideal combination of security, scalability and decentralization. Staked provides industrial scale staking infrastructure for leading PoS protocols including Tezos, EOS, Factom, Cosmos, Decred, R-Chain, OmiseGO, Thunder, Ethereum, Dfinity and more, allowing us to offer our customers the ideal solution for all of their staking needs. Staked nodes are deployed on high-performance computing resources in a multi-tier configuration that combines security and scalability while minimizing centralization on hardware providers. The infrastructure uses Kubernetes orchestration to ensure high availability and extremely low network latency, and can be scaled on-demand with network growth. AWS Shield, Elastic Load Balancing and advanced IP address obfuscation techniques are used to defend against malicious network, transport and application layer denial of service attacks. The listening cloud is comprised of publicly accessible nodes that dynamically allocate resources from multiple cloud service providers, including AWS, Google Cloud and Azure. Orchestrated by Kubernetes, the listening cloud enables near-infinite scale, self-healing and a decentralized hardware infrastructure. The signing servers are bare metal servers responsible for producing and signing blocks. They are secured in Equinix data centers in the United States, have hardware signing modules for key security, and are fire-walled so they can only communicate with the listening servers. Staked operates highly available and highly secure, institutional grade staking infrastructure for all of the leading proof-of-stake (PoS) protocols.